A PCM-H8 system shown with optional hardware controller and monitor. 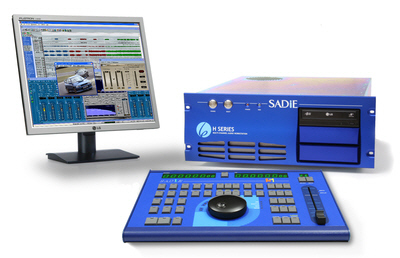 The PCM-H8 is a SADiE studio workstation based on the latest generation of DSP processing technology for use with the SADiE software environment. It is designed for complex processing and post-production applications where high levels of DSP power are required in order to achieve high speed, high power processing, but without the need for large numbers of physical input and outputs. The PCM-H8 can replay and edit 64 channels of 24bit 48kHz audio with real-time cross-fades and punch-ins, and offers similar DSP processing power to the PCM-H64 multi-track system. The PCM-H8 can be supplied with a choice of SADiE software packages tailored to specific applications. For further information about the software features, please see the SADiE software page. At the heart of the PCM-H8 is a PCM series PCI DSP card with an 8 channel daughter card. This has a 44 pin D-sub connector to for connection to an optional 19" rackmount Break-out Box (BoB800). As a turnkey system, this is supplied in a 4u rack PC with keyboard and mouse (no monitor). Specifications of the host PC change periodically and there are various PC related options for HDD size, CD burner, graphics cards etc. Please contact us for details. This is currently supplied with Windows® 7 software.